Progressiveukevents... | All the latest news, prizes, give-away's and activities about London's most "Progressive" events company – Not to be missed! All the latest news, prizes, give-away's and activities about London's most "Progressive" events company – Not to be missed! 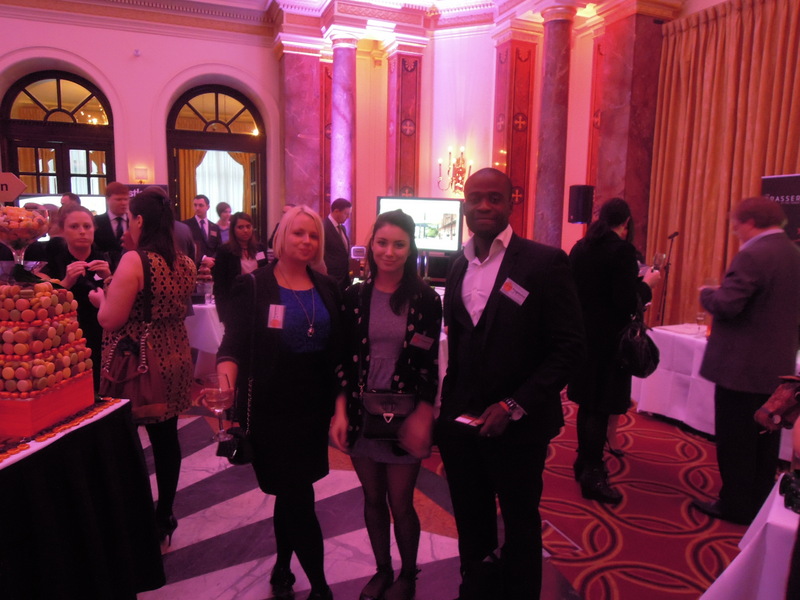 The Progressive team were invited to a party hosted by Guoman at their Charing Cross Hotel. Guoman Hotels include The Grosvenor, The Cumberland, The Royal Horseguards, The Tower and a few more both here and in Shanghai. Guoman Hotels really represent the most luxurious and historical end of the market, with hotels such as The Grosvenor being the site of high society scandal and intrigue since the Victorian era. With this kind of pedigree I was delighted but definitely not surprised when I found the Charing Cross hotel to be just as grand as I had hoped. Despite the aura of old-world glamour the Charing Cross is also very 21st century, it has just introduced free wi-fi throughout the hotel, very helpful for those of us that need to be always connected. As you have probably realized one of the things that makes us really excited here at Progressive is delicious food! 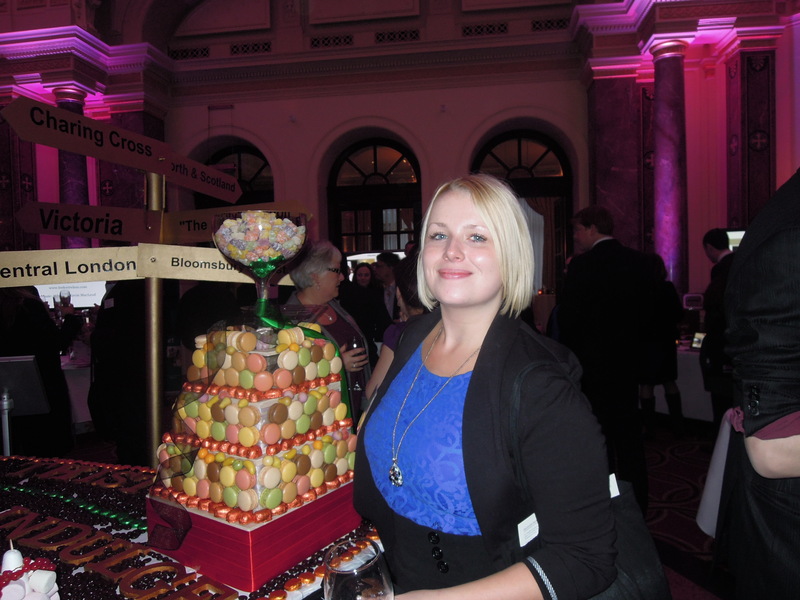 And yes that is an edible tower of yummy macaroons next to Jade. If you fancy a room in one of London’s grandest old landmarks, or think that the Guoman could provide that showstopping venue your looking for let me know. We were all super excited when Yum Yum in Stoke Newington invited us over to taste thier menu. Gordon Ramsay featured the restaurant on his show the F word as a contender for the best Thai in London and with that kind of backing I, especially, couldn’t wait to see what all the fuss was about. After the visit we can conform that the fuss is well deserved and the food is delicious! Yum Yum dominates Stoke Newington’s trendy Church Street and with good reason .The restaurant is housed in a grand old Georgian building and seats a whopping 260 people. Despite this large scale once inside it’s still keeps a feeling of intimacy and personality. The decor has succeeded in striking a difficult balance between being authentically Asian and chic and contemporary with beautiful results. After a quick tour of the restaurant we were treated to exotic cocktails and dived into the food. Jade, our lovely veggie, had lots of great options that us meat eaters wanted too. 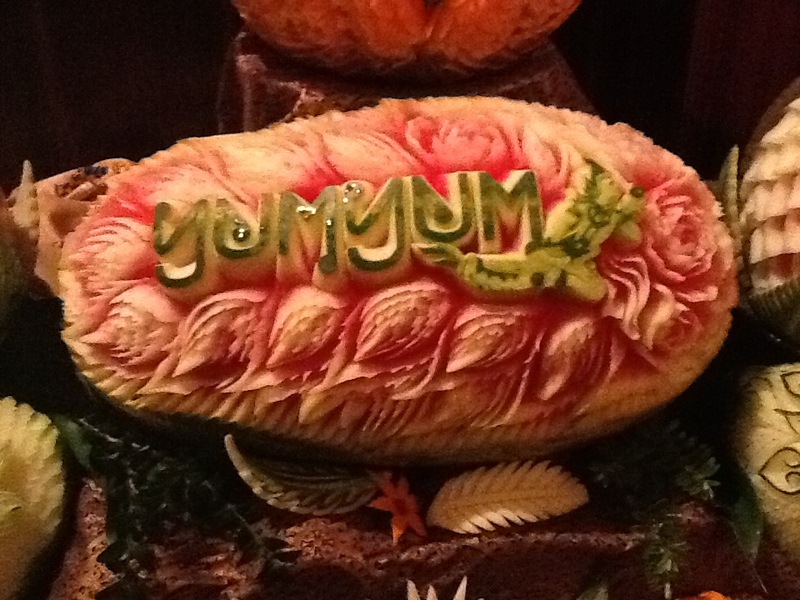 If you love the sound of our Yum Yum’s experience let us know! We can help you set up an event with Yum Yum catering or even a party in the restaurant itself. The Progressive team were invited to celebrate a very early Christmas at one of London’s most luxurious hotels The Lancaster. Having been a part of London’s skyline for over 40 years, this stylish hotel is known for its breathtaking views over Hyde Park, which we did agree were pretty amazing. The Lancaster had decked out one of its largest reception rooms in full Christmas finery with a bit of a twist. 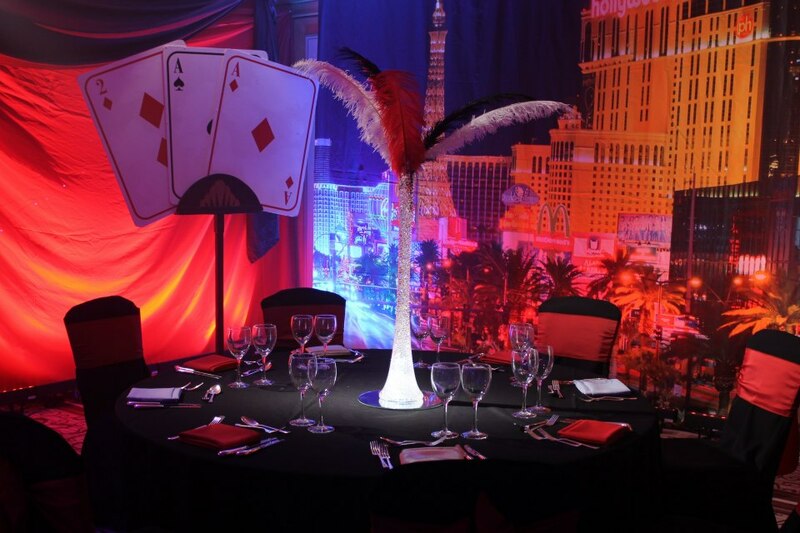 The room was divided between the themes Alice in Wonderland, Las Vegas, Venetian Masked Ball and classic Winter Wonderland. Which would you choose to add magic to your Christmas party? We found it hard to pick but had a lot of fun in ‘Las Vegas’. After a few mince pies and glasses of mulled wine we were just about ready to get involved with the wonderful London Essentials, a 6 piece band who managed to take just about every request Jade could throw at them. The Lancaster has given us loads of new ideas to start work on straight away and I am sure our events this Christmas will be our best so far! If you fancy the look of our Lancaster Christmas let us know. Progressive UK Events is one of the leading hospitality companies in the UK. We have a team of experts dedicated to arranging your perfect Christmas party. Our team of party planners are constantly researching new venues and ensuring we have the best prices on your favourite party venues. We can cater for small shared parties or large exclusive evenys. We can also tailor-make Christmas Parties to suit your company’s budget and requirements. No group is too big or small. So whether your preference is modern, funky or perhaps a venue that oozes historical relevance, we have a number of exciting and unusual venues to choose from. We pride ourselves in our high standards and our attention to detail and provide a comprehensive service from concept and planning to marketing and delivery.